Industrial Technology Mgmt. & Applied Eng. 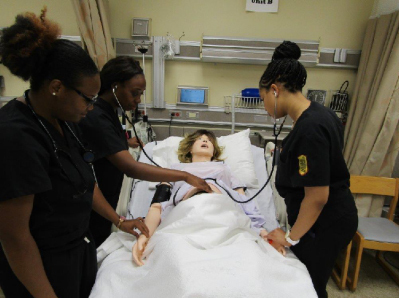 Becoming a registered nurse at UAPB is an exciting venture that leads to open doors of opportunity. The Bachelor of Science in Nursing (BSN) degree program incorporates liberal arts and nursing coursework in curricula that provide the education and skills necessary for a lifetime of personal and professional growth. The science and liberal arts components of the curricula provides the student with a foundation for advanced studies at the upper division nursing level and prepares graduates to engage in the full scope of professional nursing practice across all healthcare settings. The importance of the BSN education in the 21st century was firmly established in 2010 when the Institute of Medicine (IOM) in conjunction with the Robert Wood Johnson Foundation published The Future of Nursing: Leading Change, Advancing Health report. This report made the following recommendations; 1) prepare and enable nurses to lead change to advance health care; and 2) increase the proportion of nurses with the BSN to 80% by 2020. Open to students who have completed the prescribed core of basic science and liberal arts courses required to establish the foundational knowledge for upper division nursing courses. Upon successful completion of courses and program requirements students are eligible to apply to sit for the National Council Licensure Exam for Registered Nurses (NCLEX-RN). In Spring 2017, SimMom came to the UAPB Department of Nursing Simulation Lab ready for delivery! The 12 junior nursing students were recipient of this new ‘birthing mom’ training simulator. Prior to the arrival of SimMom, students were assigned Labor and Delivery rotations without a guarantee they would actively participate in an actual delivery. With access to SimMom, those 12 current senior nursing students and future nursing students will be guaranteed to have this critical experience in their labor and delivery rotation. The Nursing Department skills lab SimMom and Hospital Birthing Bed were paid for in total by funding from the U.S. Department of Education, Office of Postsecondary Education, Institutional Services Program, Title III Part B Strengthening Historically Black Colleges & Universities Program or Student Aid and Fiscal Responsibility Act (SAFRA). Arkansas State Law “requires students entering into medical education programs to undergo a criminal background check (CBC) during the application process and before licensure…”. The Department of Nursing uses CertifiedBackground for student admission CBC’s. Students must log on to this site, set up an account, and request the CBC. Results will be posted on the CertifiedBackground portal in a secure tamper-proof location. This allows only the student and the Nursing Department administrators to view the results. Students are responsible for all costs associated with the CBC. Both BSN program tracks are approved by the Arkansas Department of Higher Education. The *Generic Program Track is approved by the Arkansas State Board of Nursing.